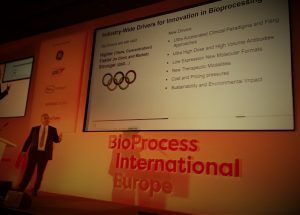 Increased titers are driving the need to move to semi and fully-continuous processing in the downstream, UCB’s Stefanos Grammatikos told BPI Europe delegates. In efforts to intensify bioprocesses and accelerate development, industry has traditionally looked to increasing titers. Since the early days of biomanufacturing thirty years ago, titers have risen from less than 0.5 g/L to mid-to-high single-digits. However, some firms claim they are able to drive titers far higher, either through the use of non-mammalian expression systems (in the cases of AbSci and Dyadic, for example) or by using continuous and large-volume single-use processes as recently demonstrated by WuXi Biologics, which claimed to have achieved cell culture productivity for an Fc-fusion protein of 51 g/L. Titer is the amount (mass, measured as weight) of an expressed agent — generally a protein in aqueous solution — relative to the volume of total upstream-produced liquid containing the agent (with the bioreactor volume often used for this amount). Data are provided in terms of grams per liter (g/L). Titer is the primary benchmark characterizing upstream manufacturing efficiency, with higher titers generally indicating that more desired product is manufactured using the same or less amount of fluid or filled bioreactor volume. Meanwhile, yield refers to downstream efficiency, here the ratio of mass (weight) of final purified protein relative to its mass at the start of purification (output/content from upstream bioprocessing). Furthermore, certain processes could push titers towards 100 g/L in the next few years, a delegate at the recent BPI West conference claimed. But speaking at the even more recent BPI Europe meeting in Vienna, Austria last week, Stefanos Grammatikos, head of Biotech Science at UCB Pharma, warned that with large titers come large problems in the downstream. “We hear about cell culture and how process intensification can bring really high titers. However, we don’t talk as much about the mess that follows that cell culture process,” he told delegates. This, he continued, all leads to issues further along the process in the downstream. “We see conventional disk-stack centrifuges which cannot cope with the cell mass.” This is driving efforts from the industry providers of centrifuges to move from intermittent discharge to continuous discharge centrifugation, he said. Other issues caused by high titers include the antibody reduction events around the harvest which are transient but sometimes irreversible and can be catastrophic for the molecule. Furthermore, capture step/affinity chromatography issues “can lead to resin damage and cleanability issues,” and push loading capacity limitations. Indeed, “high upstream titers” present challenges for the downstream processing, particularly to clarification/capture steps. Maybe it is time to revive the “old” Expanded Bed Adsorption, EBA, as it eliminates the need for centrifugation and filtration clarification steps? A little history for young readers: EBA was quite popular in the 90s for capture of mAbs and many other molecules directly from a crude feed. I also used EBA in several projects at up to pilot scales, including protein capture from dense, 40% Wet Cell Mass Pichia; some processes went smoothly and some had issues. By ~2005, most bio-pharma lost appetite for EBA due to such challenges as “sorbent-to-bead lumping”, uneven flow, cost, etc. However some versions and applications of the EBA still exist, we just rarely hear about them: for example, I am working with a client on scaling their process to a 5,000-L size EBA column as we speak. To summarize my point: maybe it is time to take another look at the EBA as a potentially useful tool for the high-titer cultures?